Return to Guernsey – GFSC need a good prod! Thanks to John Bolland for this article which is in the form of a letter to the GFSC. I read your article regarding Equitable Life with both a professional and personal interest. Last year I had a need to visit the Equitable offshore office based in Guernsey as a result of this scandal that has ensured that this GAR fiasco, caused by poor regulation and management deceit amongst other things, has gone around the globe. Investors in many countries saving for retirement have had their savings decimated when frankly if regulation had worked, many would not have so done. It was when Offshore Banking and Investing in its broadest sense was starting to grow rapidly that I first visited Guernsey. Flying over from Jersey by a small Britten-Normander aeroplane that required one to weigh-in and be seated accordingly. My project at the time was to review the systems in place in our offshore subsidiary and put in place those that could handle the rapid growth that was anticipated. This was in about mid 1974. 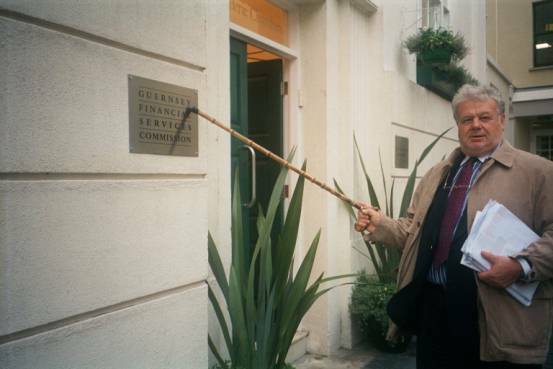 In 2001 I was there again to visit the Equitable Life Office run by Bacon & Woodrow as well as the Guernsey Financial Services Commission and the Guernsey Police Fraud Squad. Acting for myself and other interested investor parties. It soon became clear that Guernsey is not as well regulated as one might think or would have a right to expect. The Equitable farrago is a massive scandal. That the gross misrepresentation of the mutual societies financial strength and subsequent mis-selling of financial products which has been rightly likened to a Ponzi (Pyramid) selling scheme was not discovered and stopped by the regulators sooner is indicative of very poor regulation. So why did the regulators fail to spot it? Meetings with Bacon & Woodrow soon revealed that no Equitable staff actually worked on Guernsey but were based in Milton Keynes. In spite of the fact that one rang a Guernsey number and sent mail to a Guernsey address. This made many people think along with the advertising literature that they were buying into separate funds totally free of any on-shore connection. B & W claimed only to be a post box, yet Equitable claim their UK based staff were not salesmen. So who sold the products and who regulates them? They are UK based yet the FSA said it was not interested in clients of the Guernsey office. Meetings with the GFSC revealed a lack of willingness to directly help investors and an ignorance of the facts of the matter. Also no Ombudsman scheme is in existence on Guernsey so aggrieved investors have to resort to advocates. My thesis on this scandal is still in preparation but it is clear that the GFSC has much to answer for. They displayed a lack of vigilance and placed too much reliance on the lead regulator in the UK. The Guernsey Police whilst mentioning that it was like a pyramid selling scheme especially for late entrants – (this was later also likened to a Ponzi scheme by Professor Blake in his excellent report for EMAG), has shown little ability or determination to pursue the matter blaming as usual lack of resources and complexity. The so-called Compromise Scheme and attended failure to pay interest/profits as well as the 16% devaluation of funds has done little to benefit such investors. Worst hit are late joiners and locked in With Profits Annuitants. Equitable now realises also that those who fled early still have a case for compensation and have set up an investigation hoping to buy off future lawsuits. They clearly have kept back money from the WPF uncommunicated to society members to fund this. This action has been a cause of the losses sustained by over devaluation of the With Profits fund and passing of bonuses. This has caused some pensioners to have an illegal and harsh reduction in pensions in payment. Illegal because the Memorandum and Articles of this mutual society expressly forbids any robbing of Peter members to pay Paul. Clearly the regulators are to blame for not spotting such a sick society and the malpractices. Both the Guernsey and UK Governments should foot the bill for their failure. The police should also closely examine the actions of all at Equitable concerned to see if fraud has knowingly or unwittingly taken place. If fraud is found then criminal proceedings should be taken against the directors, managers and staff who are so implicated. Let us hope no Enron type shredding of documents has taken place. However, I shall not hold my breath for justice and compensation because these things clearly take time. Sadly many pensioners may be dead before it is fully sorted out. Clearly the worry will not have helped them. It will also take continued pressure from individuals and action groups to get this matter put right in a timely manner. I look forward to your continued coverage. It is one sleeping dog that should not be left to lie.